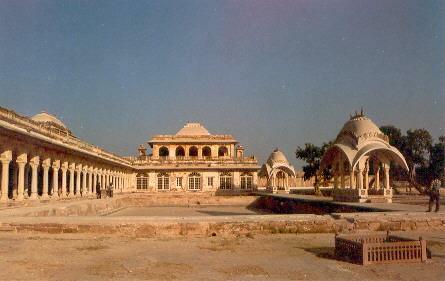 nagaur is a district in the state of Rajasthan , India. The nagaur city lies about midway between Jodhpur and Bikaner. It was founded by the Naga Kshatriyas. It is also known as the village "Khatwan". nagaur finds mention even in the Mahabharata. The kingdom of Ahichhatrapur which Arjuna is said to have conquered and subsequently offered to his Guru Dronacharya, was perhaps some of the area of the nagaur district. It was the capital of Jangaldesh. The foundation of city dates back to 4th century BC. Nagas originally ruled over this place and about 7th century onwards the Chauhans became the overlords of nagaur and it was included in Sapadalaksha. The present district of nagaur finds a place in the heart of the Rajasthan state. If we draw a cross over the map of Rajasthan the centre of this cross is bound to fall in the district of nagaur. Before the merger of the states, nagaur was a part of the erstwhile Jodhpur State. After independence, nagaur had the honour of being selected as the place in the country from where the Democratic Decentralisation process was launched by the late Shri Jawaharlal Nehru, the first Prime Minister of India on the 2 October 1959. The town of Ladnu in the district has gained its place on the map of the country being the headquarters of the famous Jain Vishwa Bharti which has become a centre of spiritual learnings and knowledge under the leadership of Acharya Tulsi, a great Jain saint, who has propagated the philosophy of Anuvrat in order to enlighten people in this area of the country. Peepasar is a small village in the nagaur Tehsil of nagaur district. It is the birth place of the Great Saint guru Jambheshwar, the founder of the Bishnoi community.